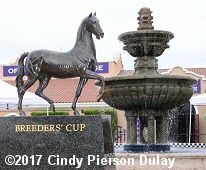 Monday, October 30, final entries were taken and the post positions were drawn for the 2017 Breeders' Cup at Del Mar Thoroughbred Club. The draw was held at "The Barn on the Beach" in Powerhouse Park in Del Mar. It took quite a while to draw all 13 races, with the Classic going last and drawing a field of 11. Gun Runner in post 5 is a narrow favorite at 9-5 for the Classic over last year's winner Arrogate, who is coming off two straight losses, at odds of 2-1 and breaking from post 1. Free past performances for all the races can be found here. This year, the Breeders' Cup will again have a total of 13 Grade 1 races spread over two days of racing with over $28 million in purse money on the line. Friday November 3rd will have four races headlined by the Grade 1 Breeders' Cup Distaff, run for several years as the Ladies Classic, worth $2 million. Saturday November 4th will have nine races headlined by the $6 million Breeders' Cup Classic (G1) at 1 1/4 miles. For the first time, the Championships will be held at Del Mar Thoroughbred Club in Del Mar, California, in San Diego County north of the city. Due to the limited space at the facility compared to last year's host Santa Anita, all tickets including general admission must be purchased in advance, and at time of writing, reserved seating for both days is sold out as is stretch run general admission for Saturday. If you still want to attend and don't wish to pay a premium on the resale market, you are limited to stretch run admission on Friday, or infield general admission for both days. Pre-entries closed at noon on October 23 for all the races and were announced on October 25, with 187 horses pre-entered. Among them are a record 45 overseas-trained runners, and 9 returning or former champions: Arrogate, Highland Reel, Drefong, Oscar Performance, Lady Eli, Champagne Room, Queen�s Trust, Finest City and Mongolian Saturday. Below is the list of races with conditions, purses, and post times for both days. The post times are not set yet so they could be changed as late as after the final entries. Click the race names to get links for info specific to that race including a list of the the top entries with link to a profile for each horse with lots more info. 2016 Breeders' Cup Friday Results - Friday was headlined by the $2 million Distaff won by Beholder. Get the results, charts, and photos for all 4 races here.